The weekend just ended was eventful for the guests and staff of Amaranthé Bay Resort & Spa, tucked away in a quiet picturesque corner in Uppuveli, several kilometres north of Trincomalee town. The staff was busy arranging an ideal spot under the freshly thatched roof in the Pool-Bar for a unique occasion, while the guests of the resort, who were invited to the event, were pacing up and down around the well-manicured garden. 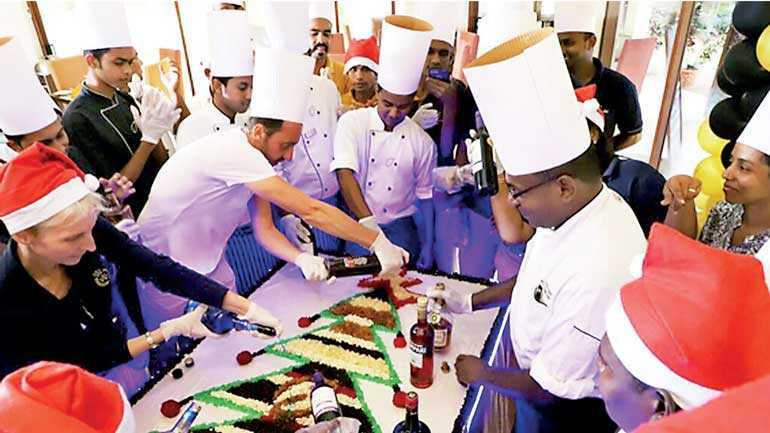 Minutes later, Chef Navindra, accompanied by his staff, marched in to the Pool-Bar and got busy with their handiwork. Moments later, the guests were invited in, to be amazed by the décor created by the Chef and his enterprising team. It is still November, a month and half away from the festive season associated with Christmas. However, the season is not exclusively celebrated by Christians alone. As the year comes to an end, multicultural and multi religious Sri Lankans get ready for a season of wines, hampers, good food and revelry. 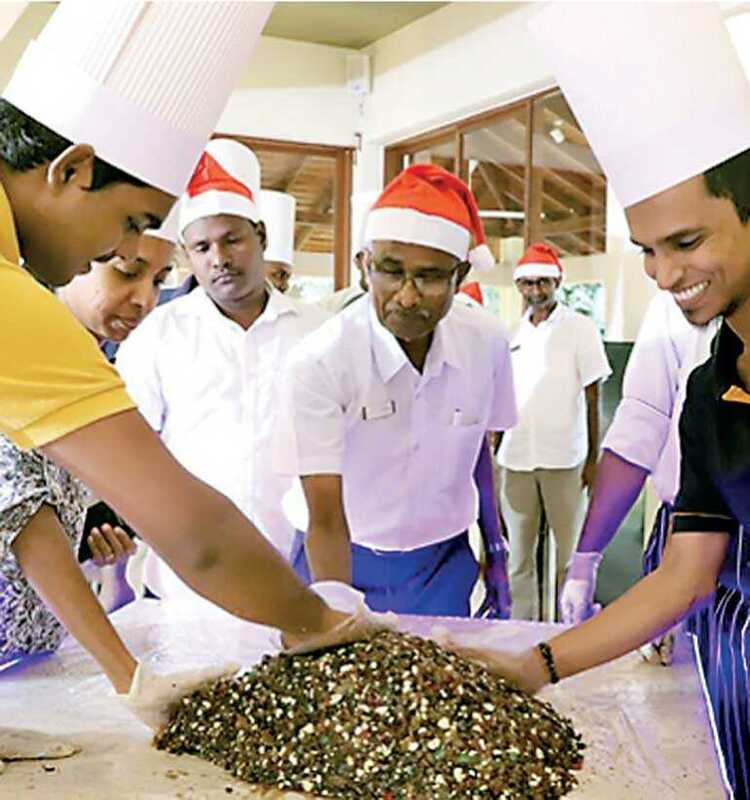 For Amaranthé Bay, this is the fourth successive year of going through the Christmas cake mixing event. It is a ceremony the staff and guests eagerly look forward to. This time, they gathered around the decorated table that had all the cake ingredients from plums to prunes and sultanas to figs, arranged in the shape of a Christmas tree, surrounded by bottles of liquor and fine liqueur. They treated the cake ingredients with a dash of fine brandy, rum, vodka and other liquor too numerous to list. They gave a grace period for the ingredients to soak in the generous quantity of liquor and then joined in a fit of frenzy to mix the ingredients. Moments later, the decorated Xmas tree was transformed in to a mixture that would be kept in a cool dark place to ferment, until such time the mix is ready for an unforgettable encounter with the oven waiting in hot anticipation. Those guests, who enthusiastically mixed the cake will be long gone by the time the cake makes acquaintance with the hotel oven and leave the kitchen with a wafting aroma so familiar with Amaranthé’s Xmas cake. When it is time for tasting, there would be a new group of tourists, who would be oblivious to the joyous occasion experienced by another group of tourists, who came together to lend their hands to mix the cake, lovingly baked by the Chef of Amaranthé Bay Resort and Spa.